Using it isn’t rocket science, really. You just twist up the pencil, which is thin and precise. Then you line your lash and water lines, and you can smudge that with a pencil brush if you want. The formula dries pretty quickly, in about 20 seconds, so there’s no transferring up into your crease. Even if you don’t think of yourself as a person who wears colorful eye makeup, this green doesn’t look obnoxiously green on lids, unlike a kelly green or a neon green. Yes, Jade Olive is pigmented, but it’s not obnoxious because it’s 1) a matte, and 2) more of a subdued shade of khaki. I think it looks extra lovely when worn with browns. Warm browns, cool browns, golden browns. Any of your favorite browns or neutrals (or even taupes!). FYI, in this same product line of matte twist-up pencils, there’s also a burgundy and a black. I haven’t tried the burgundy yet, but the black isn’t my fave because it breaks up and cracks if I accidentally use too much. You can find Jade Olive pretty much everywhere. Oh, and did I mention that it’s only six bucks?! SUCH A STEAL. Previous Post: Adventures in Lemon Cheesecake Cookies! Thanks, Noemi! They’re by Kate Spade, and from a few seasons ago. I just ordered the jade olive . Love the earrings too ! Happy holidays, Michele! Hope you love Jade Olive (I’m wearing it today, by the way). 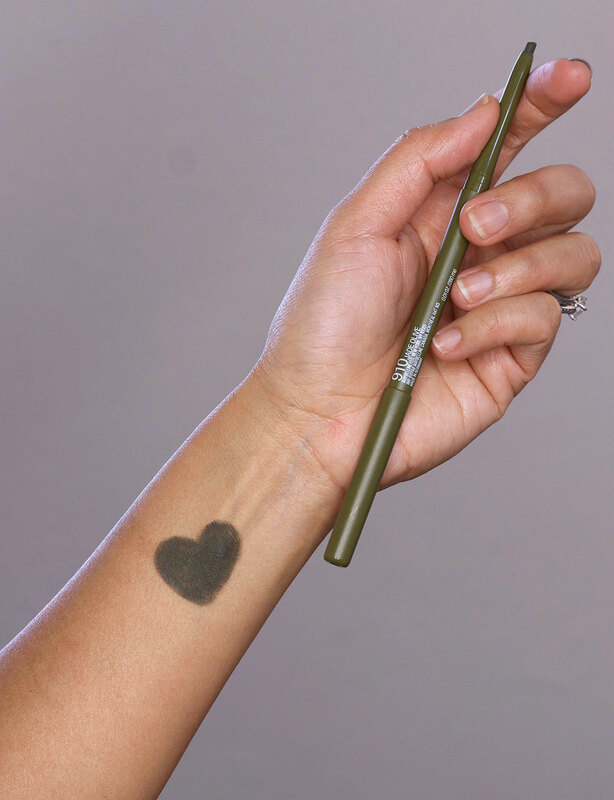 Beautiful eye pencil! If you think that you look like a judge-y piano teacher you must see the film The Piano Teacher directed by Michael Haneke, with Isabelle Huppert, Benoît Magimel, Annie Girardot. One of the few good films that shocked me. Not for children.. So pretty! And I hear you 100% on looking for something a bit less harsh than black. As I age, “less is definitely more.” Black is way too harsh for me (55 yrs. old.) Softer neutrals are much nicer and enhance the eye, which is what we want. I look forward to getting this color and adding it to my collection. I’ll have to check this out. I buy a similar Clinique eyeliner in True Khaki. Ohhh I may have to look into this one! Thanks so much for the tip! Khaki doesn´t work too well with my greenish eyes, it looks off most of the time, but I have been loving mauve and burgundy-brown versions lately. Ooh – I’m going to try it. I have been wanting an olive-ish green liner for my hazel eyes. I just about spit out my tea laughing at your judgey piano teacher comment. I think you look regal in that picture. Have a great day! I’d love to try this but I’m wary about drugstore makeup. A few years ago I tried a L’oreal eye pencil and either I’m too sensitive or that product didn’t pass standard requirements. Hurt like a mofo. I think (in the New Year, when I finally have $$ again) I’ll try a Chanel pencil. I can onl get away with black on my upper lash line, but is like to experiment with softer colors. Brown really enhances my hazel eyes. And I’m a sucker for Chanel. Thanks for the reco, Karen! I got mine yesterday from Target (free 2-day shipping, and only $5!). Smooth as silk, and Does, Not. Budge. I hope they produce more shades! Thanks Karen!! I ordered mine from Target(just for 4.99, what a steal) can’t wait to try on.. Loved your earrings!! Soo pretty.. Thanks, Karen! I picked this up and whoa, it’s awesome. I am using it for my “no” make up days–i.e., the weekend. It’s a fantastic liner/tightliner and you’re right about it being so much less harsh than black. Love it. I’m so glad you love it, Kelly! It’s been my go-to liner lately. 🙂 Isn’t it great how it pretty much works with any lid color, too?